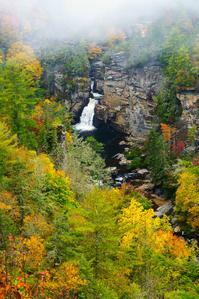 Linville Falls has two main trails: Erwin's view and Plunge Basin. 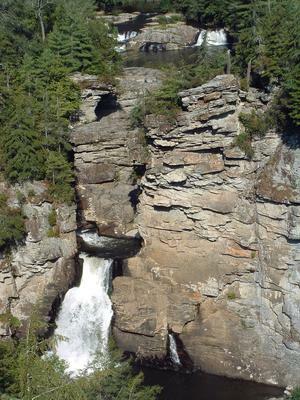 Erwin's view is the easier of the two, and stops at three main overlooks: Upper Falls, Chimney View, and the eponymous Erwin's View. This trail passes through a majestic forest of old-growth hemlock and white pines, to spectacular cliff-top views of one of the most scenic and photographed waterfalls in the East. 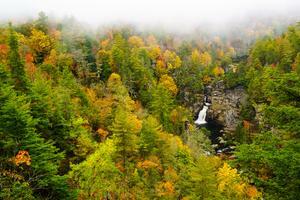 Spectacular views of the falls, the surrounding mountains, and the Linville Gorge await. This picture, taken in 2003, shows what the hemlock forest in this cove beside the trail used to look like. Only a few trees right beside the trail were still alive 11 years later in 2014. The rest - indeed, most of them in this picture - are now dead. 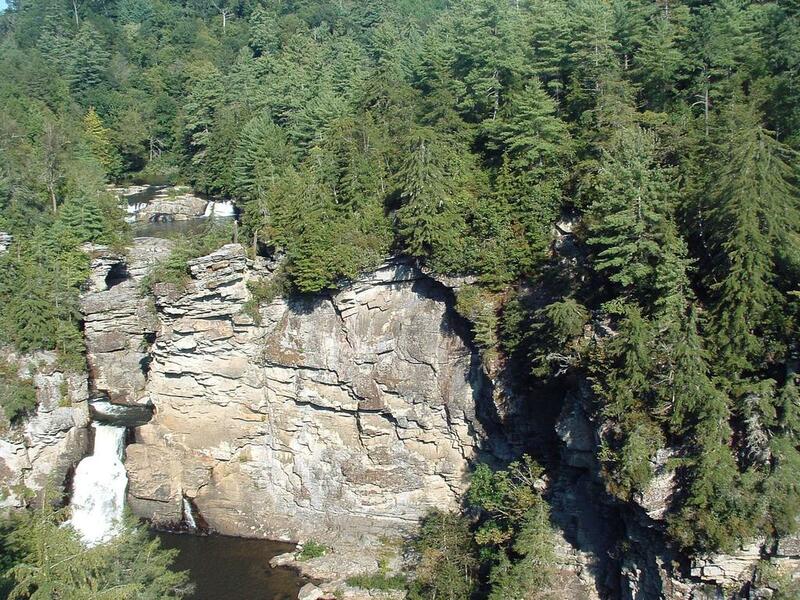 This wide, well-maintained trail takes you to three spectacular views of Linville Falls on the west side of the gorge - Upper Falls (.5mi), Chimney View (.7mi), and Erwin's View (.8mi), passing through a majestic evergreen forest along the way. 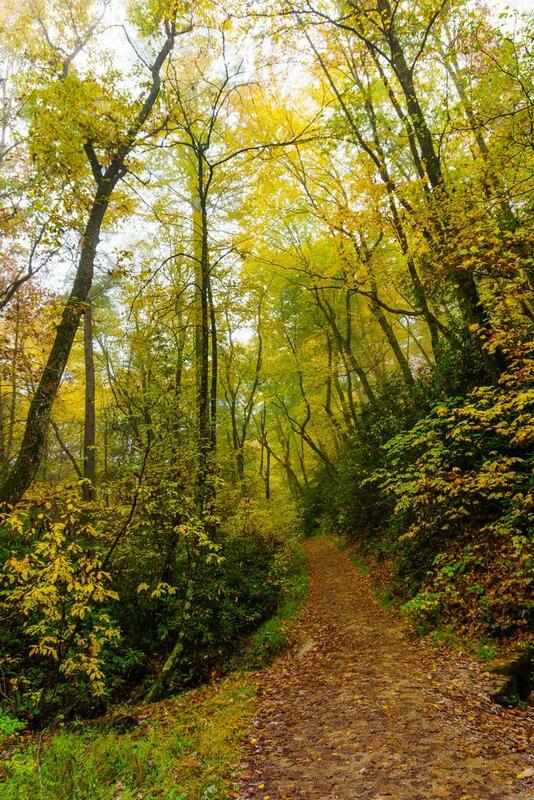 Although the park literature calls this a "strenuous" climb, it is only so by a casual Parkway visitor's standard so don't let that turn you away. If you're that casual Parkway visitor, there is one decent workout to be had near the middle of the hike, but you can take it slow - and it's worth doing in order to enjoy the spectacular forest you're walking through anyway. Side trails to the first two overlooks are a bit rougher, with some rock steps, but well worth the effort. But overall, as trails go, this one is just moderate. 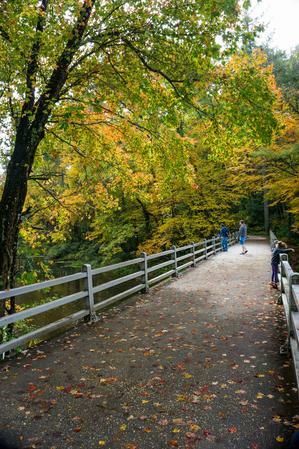 Starting from the visitor center (straight through the breezeway), cross over the Linville River on a wide concrete bridge. Past the bridge, the trail follows the tranquil river through a forest with some large trees, then climbs away from the river a bit. 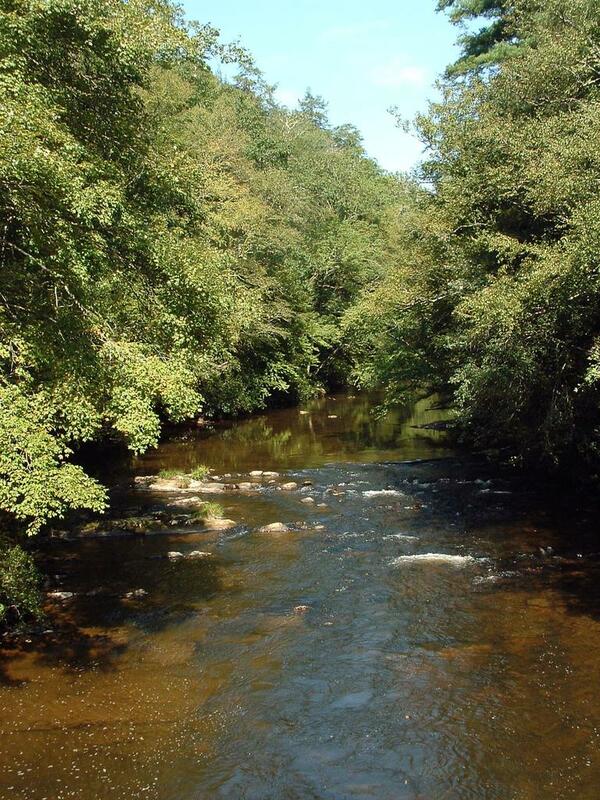 You'll meander up and down, crossing over small tributaries. 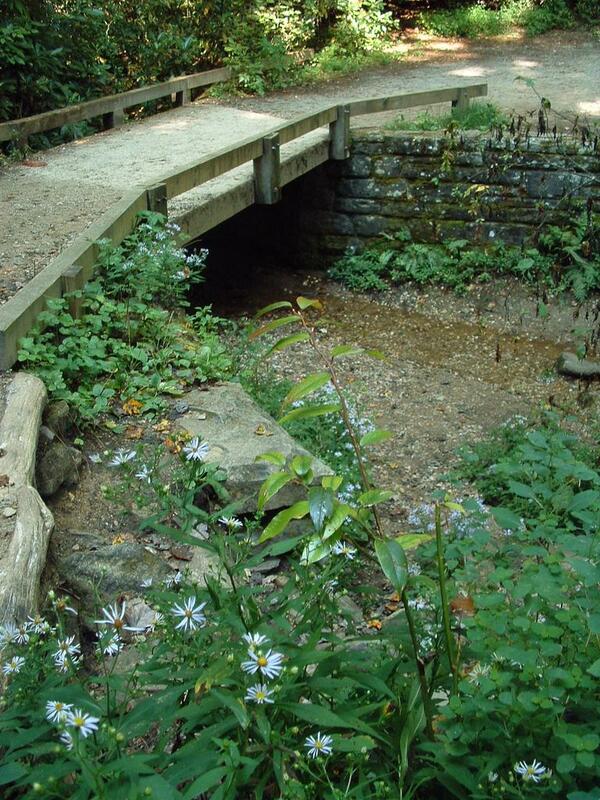 Pass through a small, open meadow, and then reach an intersection with a side trail on the right. That trail leads to the overflow and winter time gravel parking lot. Continue straight. 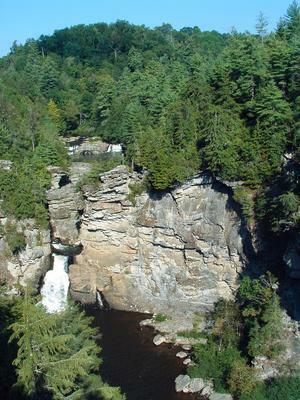 Upper Linville Falls as seen from the overlook area. The lower drop starts just to the right of where this picture was taken. Just ahead is the signed intersection with the spur to the Lower Falls overlook. It is 500' and slightly downhill to the overlook. The side trail passes through some more large trees, and through a slot in a large, broken rock. 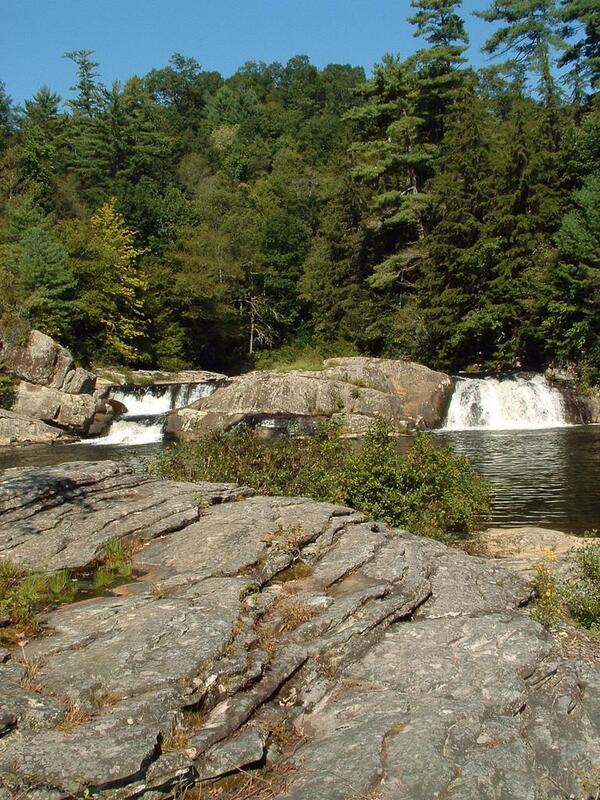 At the overlook, looking upstream, you'll see the 15 ft. Upper Falls and the huge pool below them. Downstream, you see into the neat slot canyon above the lower falls. 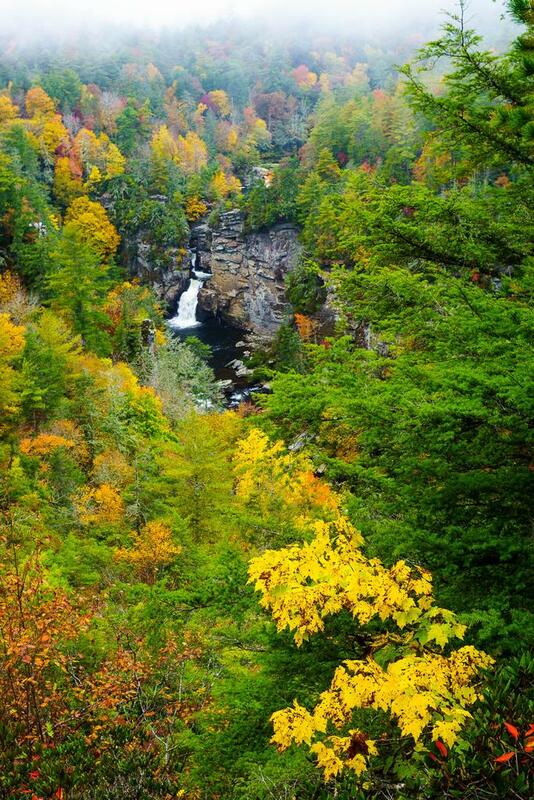 It's a neat view, but not as dramatic as the view of the entire falls from Chimney View or Erwin's View up ahead. 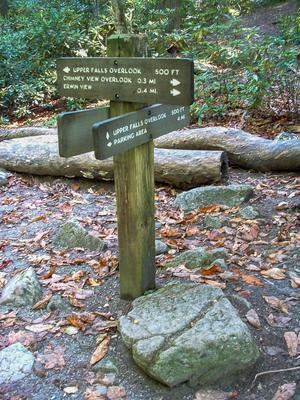 To reach those, go back to the intersection with the main trail. Continuing uphill on the main trail from the intersection, you'll pass beside another open meadow. The size of the trees growing here has a real impact on the scenery. 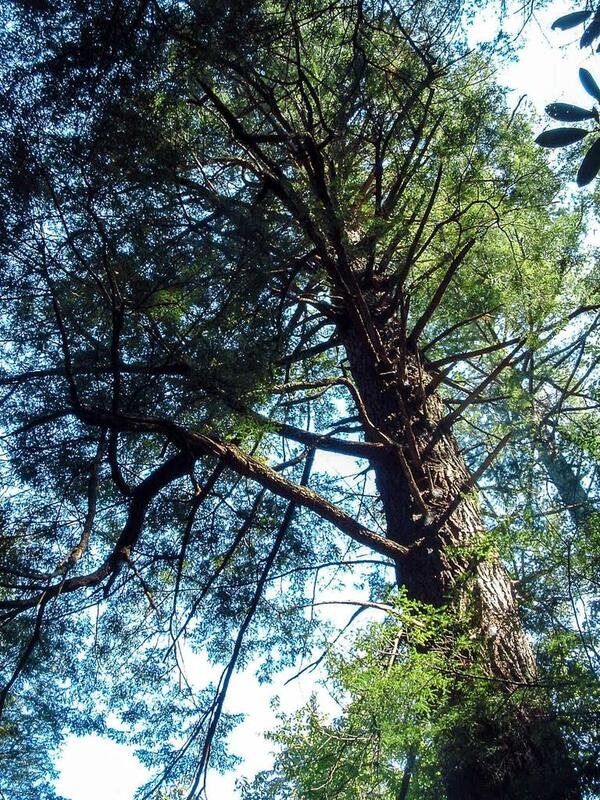 On the left grows a huge Eastern hemlock; on the right, a big, spidery white pine with long, lanky limbs. Just beyond this meadow, the trail begins the most significant climb on the hike. Despite the climb, the surface still mostly smooth, and there are plenty of places to stop and rest. Besides, the forest you are in is worth a closer look anyway! This is an old growth forest, consisting largely of Eastern Hemlocks, White Pines, and to a lesser extent, Carolina Hemlocks. Historically, these three evergreens thrived in the acidic soils found here. 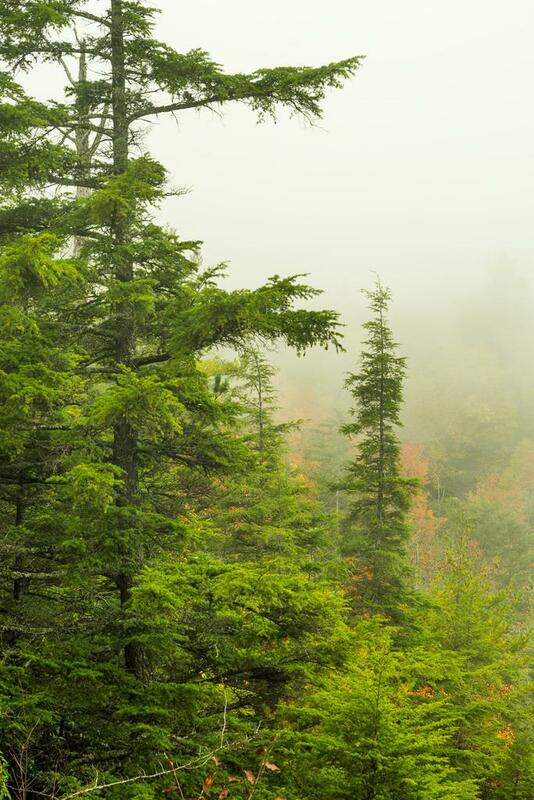 Unfortunately,the Hemlocks are in decline due to the Hemlock Wooly Adelgid infestation that took place during the mid 2000's. 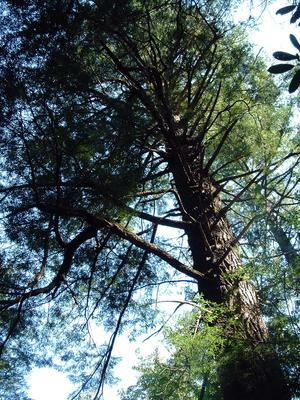 The Eastern Hemlock trees directly beside the trail were treated to fight off the adelgids, and while a few died anyway, most remain healthy. However, a vast swath of forest off to the south of the trail wasn't treated and has completely died. You'll have to use your imagination - maybe with the help of our old photo - to conjure what it looked like when the tall, dark evergreen trees went as far up the little side valley as you could see from the trail. Linville Falls as seen from the Chimney View overlook. As you crest the top of this hill, you'll come to the side path to Chimney View on the left. Some tall white pines grow there. It's a short path down a steep set of steps (and, unfortunately, eroded water bars) from there to the overlooks, which are WELL worth the climb back out to see the view. Don't skip this one. 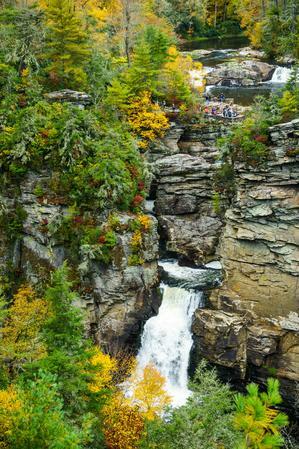 From Chimney View, there is an excellent view of the falls just up the river from your location. You can see the cliffs surrounding the falls, and you get a view directly down to the river itself. Below you, between the overlook where you're standing and the river's edge is a huge cliff. 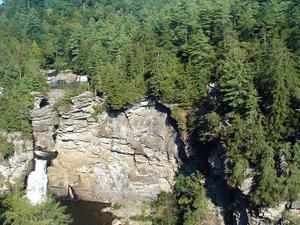 Standing off from the base of the cliff are two tall pillars of rock that look like chimneys, hence the overlook's name. There is also a good view down the gorge and to the surrounding ridges from the overlook. 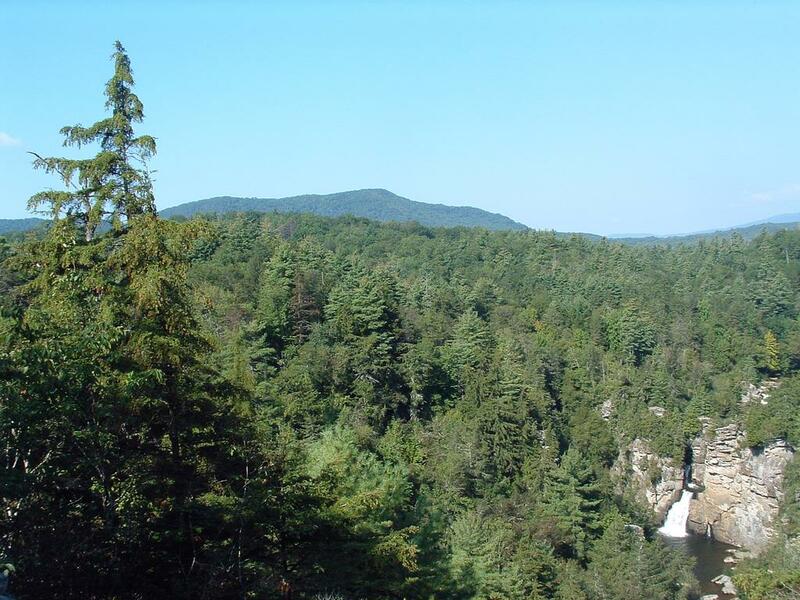 The rarer Carolina Hemlock grows in its conical form on the rock outcrops around this overlook. A few have died, but thankfully most remain healthy through the Park Service's treatment plan. 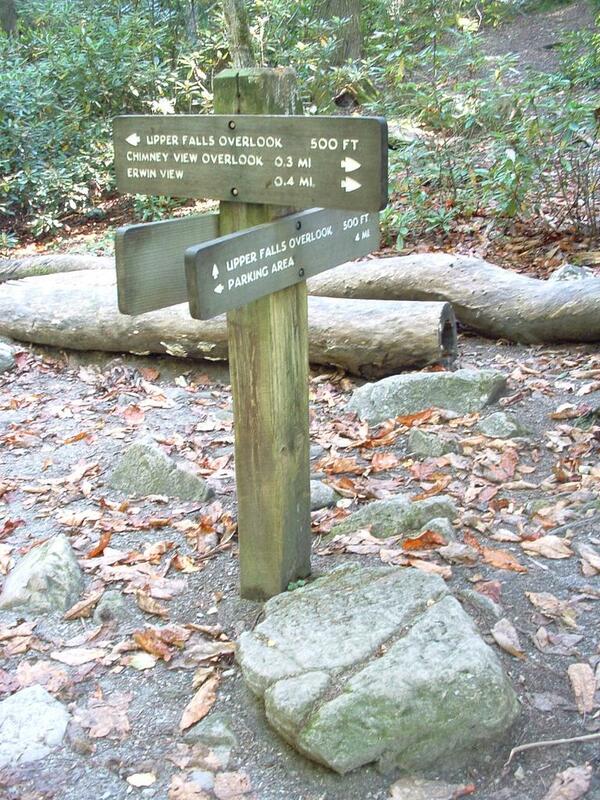 To continue to Erwin's View, hike back up the steps to the main trail and turn left. Back on the main trail, it's just a short distance to Erwin's View. The trail does climb up some more, and it's a tad rougher than the rest of the trail up to this point - but still quite moderate overall. There are actually two overlooks at Erwin's View. The first one you come to is down on the right and has a great view of the gorge downstream. 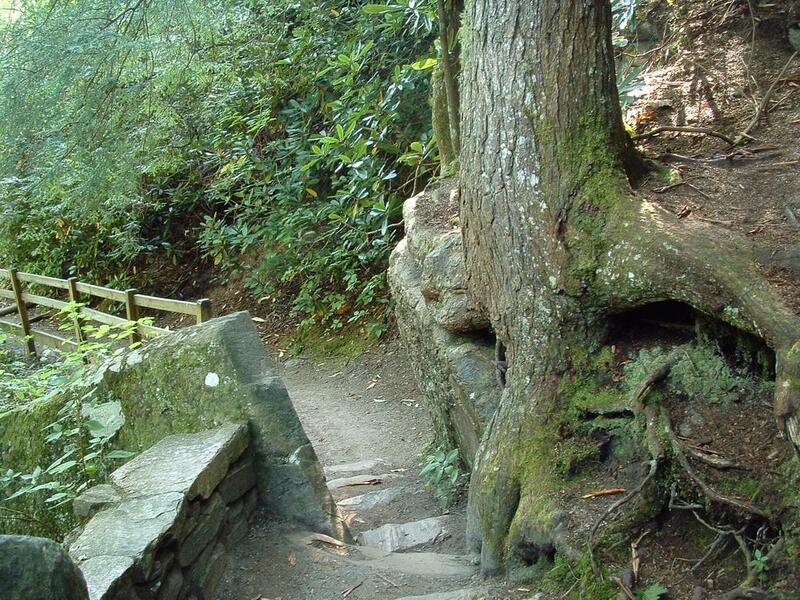 Check it out, then climb up to your left just a few feet to the main overlook. 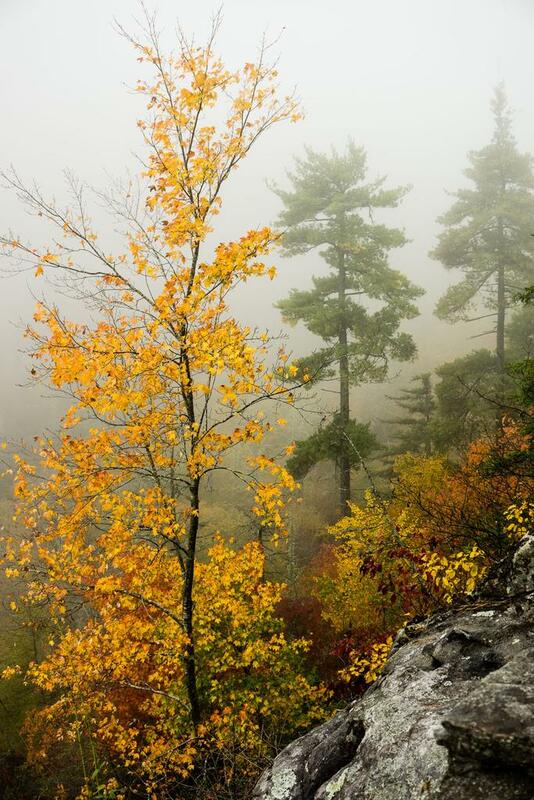 It's on top of a large, flat boulder which you'll reach by climbing up a set of wooden steps. You're a bit farther from the falls here than at Chimney View, and you not only get a spectacular view of those, but also of the surrounding mountains and ridges. 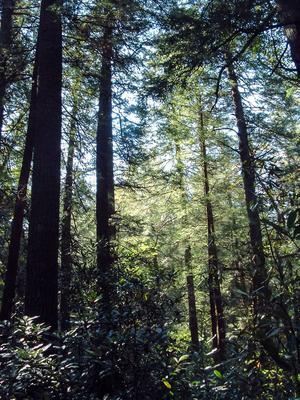 There is a nice crop of healthy Carolina hemlock trees, whose form resembles the spruces and firs you'd find higher up the mountains more than their Eastern hemlock cousins. Their presence gives the overlook a neat, alpine feel. 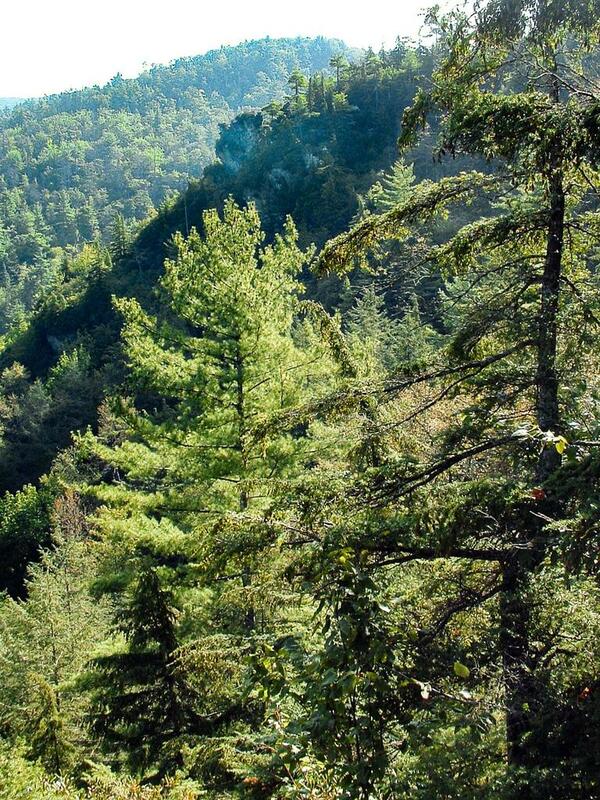 At this point you've climbed to an elevation of 3330', and it's the highest point on the hike. This marks the end of the hike as well; return to your vehicle on the same trail.